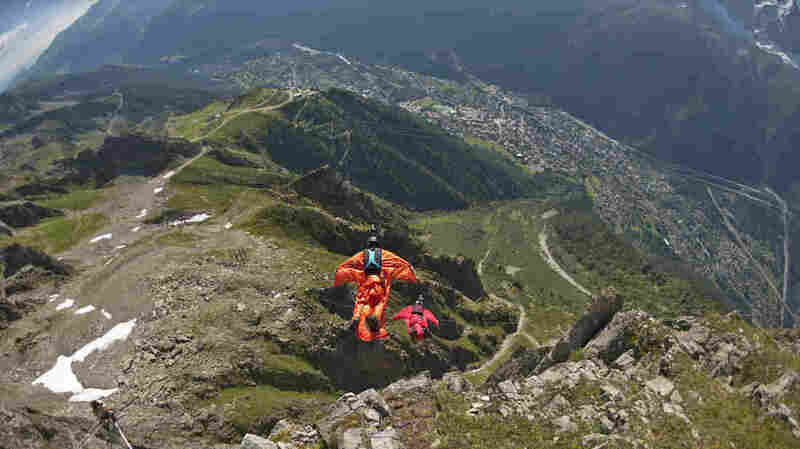 Wingsuit Flying: Incredible Thrill, But 'No Second Chance' : The Two-Way The recent deaths of two more extreme sports enthusiasts who were trying to "fly" past mountains has brought new attention to a very dangerous sport. In 2012, these two base jumpers wearing wingsuits were high above Chamonix in the French Alps. "There is no second chance ... there is no margin of error whatsoever." That's why, says Dr. Omer Mei-Dan, he and others who enjoy base jumping and wingsuit flying are grieving but aren't surprised by the recent deaths of two high-profile extreme sports enthusiasts. Mark Sutton, the English parachutist who was "James Bond" at last summer's opening ceremony of the London Olympics, died Aug. 14 in Switzerland when he flew into a rocky ridge while "flying" in a wingsuit. Mario Richard, a Canadian, died Aug. 19 in Italy "when he apparently failed to clear a rock by three meters." Richard also was wingsuiting. Mei-Dan told NPR's Robert Siegel on Monday that an estimated 6 to 7 percent of the 3,000 or so "base jumpers" who use wingsuits or parachutes die each year — an astronomical number when you consider that the USA's most dangerous job, logging, has an annual fatality rate well under 1 percent of the workforce. Base jumpers and wingsuit flyers, Mei-Dan says, are experienced. They've typically parachuted hundreds of times, or more, before trying to fly from buildings, cliffs and towers. The same goes for those who drop from helicopters above mountains and canyons, and then use their wingsuits to try to whiz by as close as possible to the rocks and ridges below. Among the dangers, says Mei-Dan, is the temptation to "push the envelope": To try to go closer to a rock wall, for instance, than anyone else. "When you push the envelope and you don't have a margin of error, you [can] pay for it," he says, with your life. So why do it? The experience of flying toward the ground in a wingsuit is "almost indescribable," Mei-Dan says. "It's something that you really have to try to understand what type of feeling you get when you're freefalling next to a cliff." There are many videos on the Web of wingsuit flyers — many of them heavily edited productions with dramatic music. This one posted by Sutton in 2012, though, offers a pretty good sense of the physical challenge of getting to a takeoff point — in this case, on Mount Eiger in Switzerland — and then the thrill of flying down. Much more from Robert's conversation with Mei-Dan is due later Monday on All Things Considered. We'll add the as-broadcast version of the conversation to the top of this post. To find an NPR station that broadcasts or streams the slow, click here.